Episode 11×05 “The Collaboration Contamination” — Sheldon and Koothrappali confide in Bernadette when they can’t handle Amy and Wolowitz working together. Also, Penny and Leonard learn new tactics for how to deal Sheldon from an unlikely source. Air Date: Monday, Oct. 23 (8:00-8:31 PM, ET/PT) on CBS. 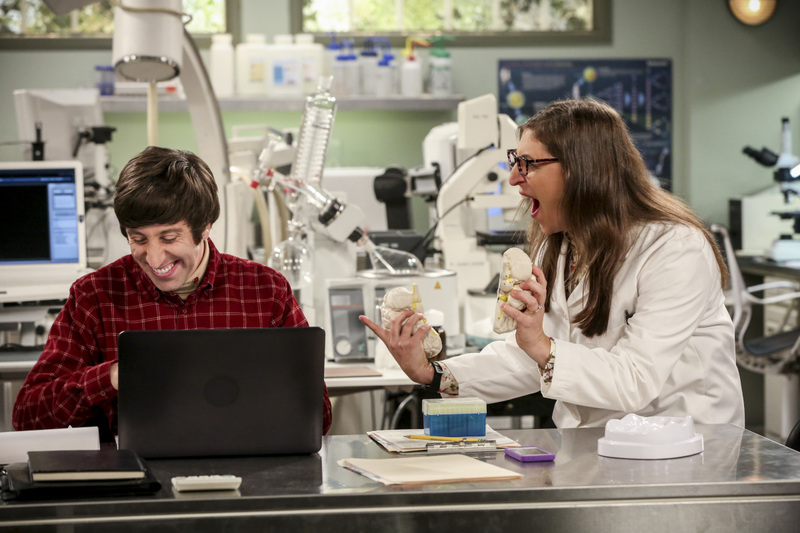 "The Collaboration Contamination" -- Pictured: Howard Wolowitz (Simon Helberg) and Amy Farrah Fowler (Mayim Bialik). Sheldon and Koothrappali confide in Bernadette when they can't handle Amy and Wolowitz working together. Also, Penny and Leonard learn new tactics for how to deal Sheldon from an unlikely source, on THE BIG BANG THEORY, Monday, Oct. 23 (8:00-8:31 PM, ET/PT) on the CBS Television Network. Photo: Michael Yarish/Warner Bros. Entertainment Inc. ÃÂ© 2017 WBEI. All rights reserved.